With a potent blend of age-defying ingredients, this nutritive eye cream wages war on fine lines, wrinkles, crêpiness, shadows, puffiness and pigmentation (phew!). Gold ferment (renowned for its skin-reparative abilities) works alongside a cocktail of vitamins and botanical extracts, to restore precious moisture and in turn, strengthen the delicate fabric of your skin. Amongst others, vitamin A (retinol) gently resurfaces so lines appear less prominent, while vitamin C brightens and unifies skin tone – minimising the appearance of age spots – whilst stimulating the synthesis of collagen and elastin. 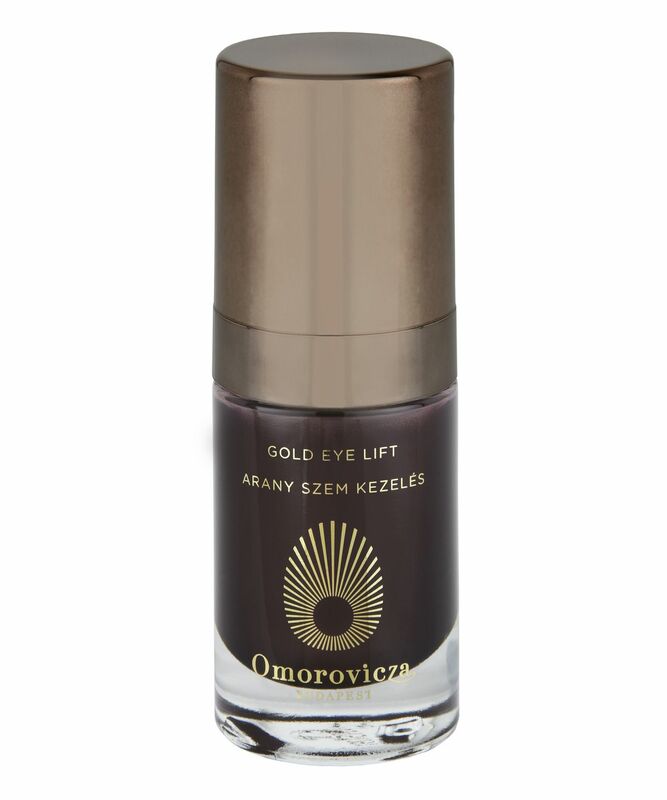 Omorovicza’s Gold Eye Lift harnesses the powerful anti-inflammatory properties of gold to fortify the delicate skin surrounding the eyes and repair tissue damage. The rich yet easily absorbed cream successfully combats all the primary signs of skin ageing; reducing the depth and appearance of fine lines and wrinkles, increasing elasticity, brightening areas of hyperpigmentation and correcting damage whilst protecting against attack from free radicals. Vitamin A (retinol) gently resurfaces so lines appear less prominent and tell-tale signs of sun damage are reduced; vitamin C brightens and unifies skin tone – minimising the appearance of age spots – whilst stimulating the synthesis of collagen and elastin; vitamin E wards off the harmful effects of environmental aggressors and vitamin F keeps skin feeling soft, hydrated and nourished. Palmitoyl tripeptide and caprooyl tetrapeptide fortify dermo-proteins to tighten and improve skin firmness, while chicory root fructo-oligosaccharide has a revolutionary ‘3D sequential release technology’ that tenses skin along the eye contour throughout the day. Aqua (Hungarian Thermal Water), Rosa Damascena Flower Water, Citrus Aurantium Dulcis (Orange) Flower Water, Glycerin, Butyrospermum Parkii (Shea Butter), Simmondsia Chinensis (Jojoba) Seed Oil, Squalane, Caprylic/Capric Triglyceride, Cetearyl Ethylhexanoate, Cetearyl Olivate, Stearyl Heptanoate, Cichorium Intybus (Chicory) Root Oligosaccharides, Cetearyl Alcohol, Sorbitan Olivate, Ascorbyl Tetraisopalmitate, Prunus Armeniaca (Apricot) Kernel Oil, Cera Alba (Beeswax), Saccharomyces (Hungarian Thermal Water) Ferment Extract, Helianthus Annuus (Sunflower) Seed Oil, Phenoxyethanol, Mannitol, Sodium Lactate, Glycine Soja (Soybean) Oil, Arnica Montana Flower Extract, Laminaria Digitata Extract, Safflower Glyceride/ Palm Oil Aminopropanediol Esters, Xanthan Gum, Disodium EDTA, Pyrus Malus (Apple) Fruit Extract, Prunus Domestica Seed Extract, Tocopherol, Ethylhexylglycerin, Phospholipids, Saccharomyces Gold Ferment, Retinol, Gluconolactone, Chlorella Vulgaris/ Lupinus Albus Protein Ferment, Pectin, Caesalpinia Spinosa Gum, Yeast Extract, Medicago Sativa (Alfalfa) Extract, Sodium Benzoate, Palmitoyl Tripeptide-5, Gryceryl Caprylate, Caprooyl Tetrapeptide-3, Dextran. I have started using this eye cream 10 days ago. The texture and the smell are lovely and it has diminished my fine lines. During the day it is a perfect base for concealer. Expensive but worth it. I have been using this cream for a month now. Although it is indeed luxurious and has a lovely texture, I have not noticed a massive difference with other products. For the price tag, I would have expected it to work harder, specially reducing puffiness and bags. I am not sure I'll purchase this again, as I find there are cheaper products that deliver as much, or even better results. I have tried MANY eye creams because I've suffered from fine lines since my twenties. As I'm in my late forties, in addition to smoothing my fine lines, the lifting function of an eye cream has become a must for me. This cream provides a unique solution compared to previous products I have used. It not only soothes my undereye, but it also gives the feeling of firmness without stretching my skin . Additionally, like the all other Omorovicza products it has a silky, light texture with a refreshing feel . It is so amazing that with even a small pot in my finger which diffuses easily on my skin, it's so effective without the feeling of having a cream on my skin. I am finally happy that I found my lifetime eye cream. if you’re in the market for something seriously luxurious then it’s worth the serious outlay and more. This has a gorgeous texture – it’s more of an ointment than a cream. You don’t dip into the pot and come out with a blob of product, you just kind of slide your fingertip over the surface and then pat onto the under-eye. It’s actually very difficult to use this up quickly (thank God) and after a year I still have almost a full pot. It’s a dream under makeup and equally beautiful as an overnight treat – a lifting and tightening effect during the day and through the night it seems to really relax and rejuvenate the eye area. This is one of the products you don't regret buying despite the steep price. It pretty much does everything for my late - thirties skin with apparent crow's feet: it firms, it wears super smooth under make up and delivers well throughout the day into the night when you take your make up off. As a night cream it's a dream. It de-puffs and brightens. Also, the smell is DIVINE, a deep gardenia that's lovely to fall asleep to. Almost like aromatherapy. I adore this range: everything feels luxurious and actually does what it claims. Thank god, as it's an expensive range. However, if like me you are willing to pay for products which deliver, then I highly recommend this eye cream. I am super critical of eye creams and have tried just about every one. My previous favourite, Verso, has been overtaken by this one. Love it! It's a great make-up base and concealer looks so much better over it and also definitely improves the eye area overnight.